Rick and Fiona Stafford live at Frogs Hollow on a 100 acre property with one of the few remaining ‘valley fill’ swamps along major waterways in the Bega catchment. They are about to start a project with the Southern Rivers Catchment Management Authority to protect the swamp from erosion. Rick and Fiona moved to the Bega Valley from Melbourne where they raised a family whilst running a hay and grain store and a pet supply store over 20 years. They made the move here four years ago, drawn by the beautiful views of the ranges, the proximity to the coast, access to an airport and a reasonably sized town centre. They wanted to manage some land for small scale production in a way that also improved the environmental assets of the property. Both Rick and Fiona were new to farming when they arrived and have been learning on the job ever since. Being keen observers, they are quickly getting to know their land and are working out successful ways to manage it. Says Rick, “I’ve learnt a lot through trial and error. You just have to get in there and give it a go”. The Staffords have tapped into local knowledge through neighbours involved in Landcare and by joining the rural fire service. Other useful places for advice have been stock and station agents and farm supply stores. ”I also went to a couple of field days which gave me some new ideas to try out on the property” said Rick. The property was largely cleared when the Staffords arrived, with a small number of remnant Bega Dry Grass Forest species still present including a sparse Eucalyptus baueriana (Bluebox) canopy and some native grasses. Patches of Melaleuca ericifolia (Swamp paperbark) were growing and regenerating in wetter areas. Rick and Fiona started off planting around 500 trees for windbreaks and controlling weeds like blackberry and fireweed. 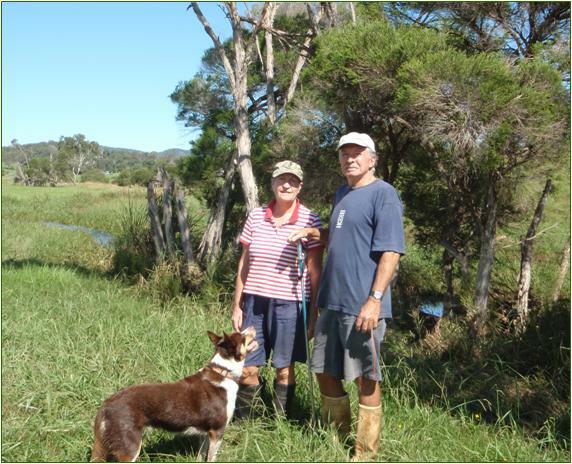 They called in Landcare for advice about some erosion in the swamp and eventually developed a project to protect the swamp with the help of Shannon Brennan from the Southern Rivers Catchment Management Authority. The project involves fencing to control stock access to 2.75 hectares of the wettest areas, installing water troughs for stock, and revegetating the site with 600 plants native to the area. The plants will help hold banks in place where the swamp has eroded and will work with natural regeneration of grasses, reeds and rushes to slow down the velocity of water and help trap sediment from higher in the catchment. The protection of the swamp much more likely to succeed because it complements a riparian fencing project undertaken by their neighbour downstream last year. The swamp will be more stable and the habitat corridor values will be greatly increased. Rick and Fiona love wildlife and animals. In addition to their swamp restoration project, they said “we’d like to create a corridor for wildlife from the creek to other parts of the property and improve habitat to attract smaller birds”.